Cook the tortellini according to package instructions. Cook the bacon in a large skillet. Once crisp, place the bacon on a paper towel lined plate to drain. Drain off about half of the bacon drippings. Turn the heat to medium-low and add the garlic to the remaining bacon drippings. Cook for about 30 seconds, then sprinkle the flour into the pan and whisk for about 1 minute to cook the flour. Add the milk, whisking constantly. Add the salt, pepper, lemon juice, and basil, and bring the mixture to a light simmer. 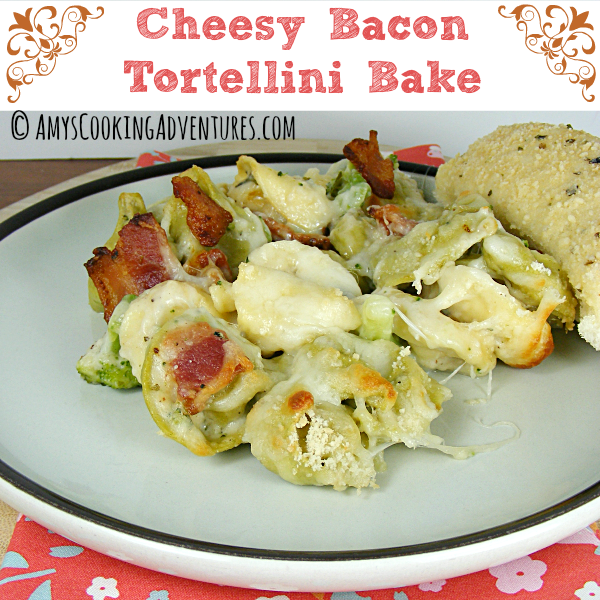 Pour the cooked (and drained) tortellini, broccoli florets, ½ cup mozzarella cheese, ½ cup parmesan cheese, and crisp bacon to the sauce skillet and stir to combine. Pour the mixture into a 9x13 in pan, then sprinkle the remaining cheeses over the top and bake for 20 minutes or until the broccoli is cooked and the cheese begins to brown.